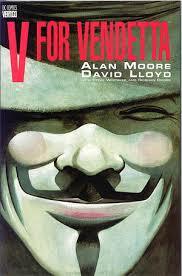 Have never dug into the origins of the rising use of the Guy Fawkes masks as a symbol of the modern anti-establishment movement, but they are likely to have been inspired by Alan Moore and David Lloyd’s brilliant graphic novel published in the early to mid 1980s. Apologies if I’m stealing any of @Thetowncrier96’s thunder (who has a Guy Fawkes mask Gravatar), but V for Vendetta was a truly unique story in the comic book world at the time. A bleak post-nuclear war Great Britain living under an autocratic fascist society in which one man inspires the people to overthrow the government and choose anarchy. Guy Fawkes was caught, tried and executed for his involvement in an attempt to assassinate the British King James I in the early 1600s. The Gunpowder Plot is associated with anarchy since this scheme involved blowing up the House of Lords, immortalized in a poem noting the day Fawkes was captured. I had already been curious about paradoxes when I picked up this story, so its central theme of anarchy versus autocracy caught on with me immediately. Growing up in the mainstream culture taught me to reject anarchy as being an unacceptable model for society to live under. That still holds true for me, but the story forced me to confront my prejudices of the concept. The extreme logic that suggests absolute freedom requires an absence of government is unrealistic, however, history and the development of political systems have followed a path away from power being held by few or even one person. This trend of thought met with the pattern of progression when it comes to the styles of leadership I was being taught around that time in business. 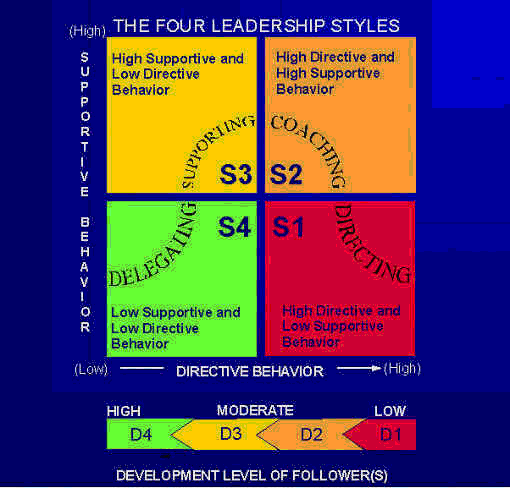 The Situation Leadership model shown here states that, starting with the lower right hand square going counter clockwise, as you deal with a more educated, skilled, and self-motivated workforce, the less on-hands directive leadership that is required by management. However, while this model confirmed my thinking towards the shift from autocracy towards anarchy, it also placed the onus on the people to also grow to support that change. This aligned with a key in the story in which the distinction made by its central character between anarchy and chaos. He pointed out that without order, society could not have any harmony, the difference being that under anarchy, that order would be self administered. Of course, this thought is no different than being told that you can’t move out of your parents house until you become responsible enough to live on your own, but somehow, that seems lost when it comes to freedom. More relevant is the question of whether by invoking such ideas, whose interests are being served, society’s, or the invoker who is more motivated in shaping the world to fit his views? This all has led me to two conclusions about approaching values that guide not only how our leaders run our society, but we as its people as well. First solidified my thinking about paradoxes – that extremes like autocracy and anarachy could be placed as polar opposites on a continuum with self interest on the one side and public or broad interest on the other. This idea has always been more helpful to me than the usual muddled labeling of left and right wing politics. Second, more relevantly, is that these values cannot be considered in isolation, at least when it comes to how they are considered in the context of the common good. Freedom, especially of the absolute kind called for by anarchists, can never serve the public interest by itself. It must be accompanied with similar development and growth in other values like order, compassion, and cooperation. In fact, these, and so many others, can be placed in similar self-to-broad interest continuums that need to work in conjunction to foster a mutually prosperous community. 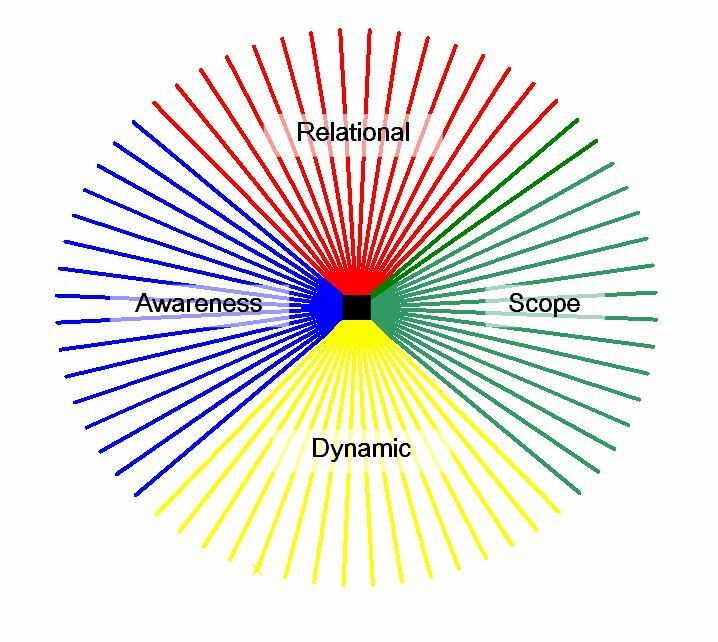 This is what is being represented in my 4dframework logo and the graphic below that I showed in my NaBloPoMo Day 1 post. The lines each represent a self-to-broad interest continuum with the broad interest ends, I call progressive, radiating outwards. Each continuum falls into one of the four dimension categories also described in that post. The circular shape represents the need for the continuums to be equal for there to be harmony. I’ll get further into explaining the graphic and its application in a later #NaBloPoMo post. This includes the irony of the paradox and continuum – that by being extreme on the one value, like anarchists do with freedom, more harm can be done than good. There is another important way this line of thinking aids in the understanding of freedom which will be the subject of my post tomorrow.